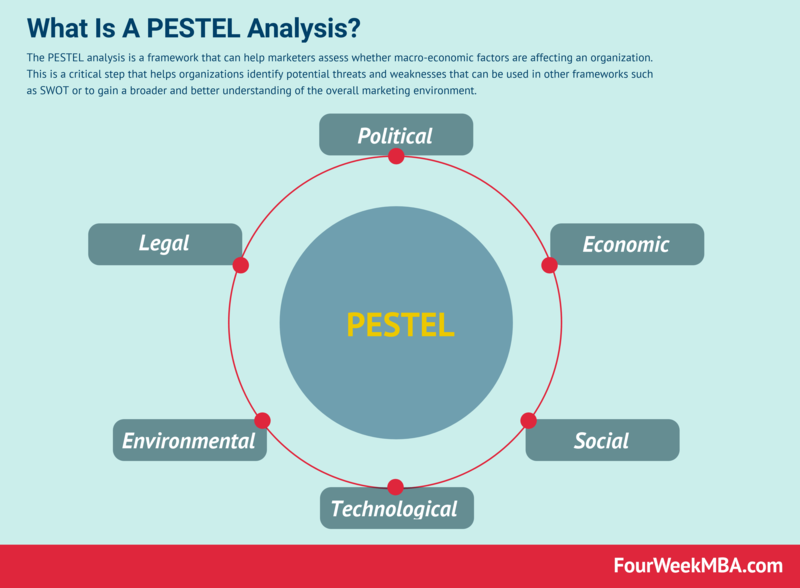 The PESTEL analysis is a framework that can help marketers assess whether macro-economic factors are affecting an organization. This is a critical step that helps organizations identify potential threats and weaknesses that can be used in other frameworks such as SWOT or to gain a broader and better understanding of the overall marketing environment. Why does a PESTEL analysis matter? A PESTEL analysis is one of the tools and frameworks that marketers can use to assess the impact of external market forces on the organization growth and profitability over time. Indeed, the PESTEL analysis becomes a companion framework to other tools, and frameworks, like the SWOT analysis as it allows to gain a broader perspective on the overall market and industry where the organization operates. In too many cases marketers fall into the trap of analyzing an organization as it operated in a vacuum. Understanding macro trends, and how those are and will affect the organization is a crucial skill for marketers to gain perspective on the company’s overall marketing strategy. And to perform a better analysis of the current and future scenario. This also allows an organization to formulate a better business strategy. This also helps organizations adapt their business models based on the changing macroeconomic landscape. What are the critical components of a PESTEL analysis? Political: how much is the government involved in the economy or in that particular market? And how much a government policy can influence that? Economic: how much economic factors, such as interest rates, employment, foreign exchanged, unemployment and other factors will affect the company’s profitability? Social: how much emerging trends or demographics, such as population growth, age distribution, and so on affect the organization? Technological: how much technological innovation, development, and disruption might affect a market or the industry in which the organization operates? Environmental: how much the surrounding environment and the impact of a business on ecological aspects are influencing the organization policies as well? Legal: how will change in legislation affect the organization’s profitability, sustainability, and growth?